When the subject of gold comes up, what many people think of first is the traditional yellow gold that has been the most recognizable form of the precious metal. In recent years however, white gold has managed to attract a fair amount of attention of its own. But aside from their color, what is it that makes these two different? This comparison article aims to clear that up. A white gold ring rated at 18-karats contains exactly the same amount of gold as a yellow gold ring rated at 18-karats. Both contain approximately 75% pure gold. However, the alloys that make up the remaining 25% are what give each type of gold its characteristic color. Yellow gold is made from a mixture of pure gold and copper and zinc metal alloys. White gold on the other hand is made from gold and metals such as silver and palladium, which give it its white color. There was a time when nickel was the alloy often mixed with pure gold to produce its white color. However, nickel is known to cause allergic reactions in many people, which is why it is no longer used today. Yellow gold is the most common type of gold used in rings and most other forms of jewelry. Yellow gold rings were particularly popular during the late 1930s and 1940s. These types of rings were also quite common during the Edwardian period from 1901 to 1910. One advantage of yellow gold is that it does not have to be re-plated, while white gold often has to undergo this process. In addition, the alloys used in yellow gold are far less likely to cause allergic reactions in people than the alloys used in white gold production. White gold is a particularly popular choice for wedding rings nowadays, since they have a similar silver hue as platinum and titanium rings, but are a lot less expensive. White gold is also a more durable and scratch resistant blend than yellow gold, because of the tougher alloys used in the mix. That being said, white gold is malleable enough to be fashioned into jewelry just as easily as yellow gold. 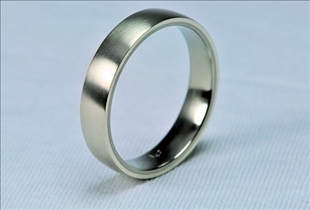 This makes white gold rings easy to re-size if needed, which is something that would be very difficult–if not impossible–with titanium and platinum rings. White gold also works remarkably well with diamond rings, and it tends to show off the diamond’s true color, unlike yellow gold, which tends to impart a yellowish appearance. While yellow gold is ideally suited for people with warmer skin tones, people with cool skin tones may take on a sallow look when wearing yellow gold jewelry. Yellow gold is also not quite as fashionable as white gold and platinum nowadays, so it isn't exactly the best option in terms of fashion appeal. 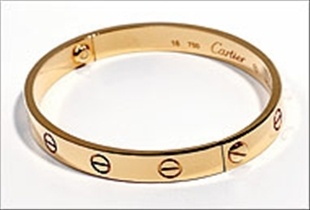 Yellow gold also requires frequent polishing, and the more vulnerable surface makes it prone to scratching. As mentioned previously, white gold rings that use nickel may cause allergic reactions in some people. In addition, some white gold jewelry may lose their shine over time. This is because the rhodium that is used to give white gold its characteristic bright and silvery hue eventually wears off. White gold jewelry could therefore have to be re-plated every year. Which type of gold do you buy more often?